Hey! City of DeBary, Florida…Don’t touch J.J Hart’s ducks! The “ducks” in question are actually chickens that the Hart family purchased to help supply his diet with fresh eggs. Over time, a wonderful thing happened. 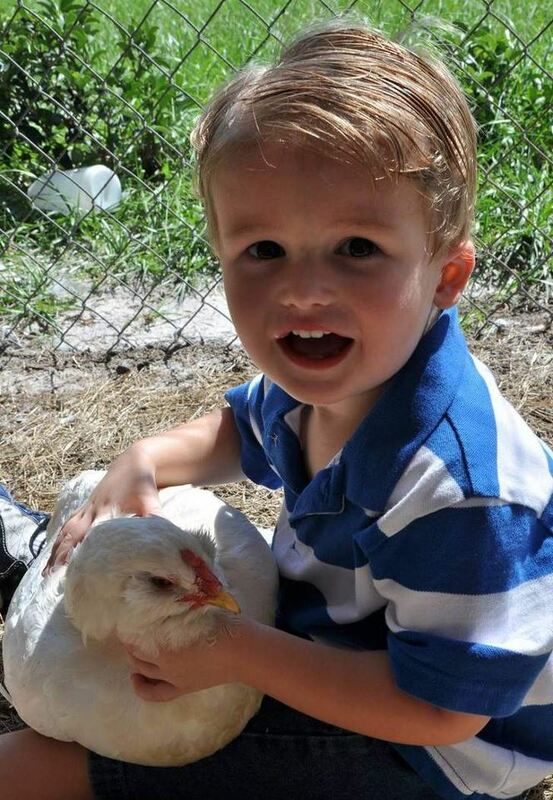 J.J developed a connection with the chickens and now affectionately calls them his “ducks.” You see, two-year old J.J has autism spectrum disorder; a complex disorder of the brain that causes a some children and adults to have difficulty with communication, behavior, and social interaction. The chickens are therapeutic for J.J and are helping him overcome some of his autistic traits including some of his communication hurdles. Since having the chickens, J.J has finally started to talk and even said “I love you” for the first time. The problem is that the city claims the chickens are a “public nuisance” and not legal in a residential neighborhood. The Harts have done their homework and after looking over all the codes, they can’t find a single one that says “no chickens.” Despite the lack of evidence for this “no chicken code,” the city Code Enforcement Board found the Harts in violation. After December 9, if they have not gotten rid of J.J’s chickens (“ducks”) and come into “compliance” with the City or made their plea to the City Council, the Council will begin fining the family $100 a day that the chickens remain on their property. It should be noted that the neighbors don’t mind the chickens. One neighbor stated his dog is more annoying to the neighborhood than the chickens. Not everyone must feel that way, because two weeks ago someone beheaded four of the chickens (two hens and two babies) while the family was asleep. During the police investigation, the family kept J.J inside, who kept insisting he wanted to see his ducks. I can’t imagine the horror and the pain the family must have experienced knowing that four of J.J’s beloved “ducks” were gone. The Sheriff department concluded that it was an animal and not a human that beheaded the chickens. The family strongly disagrees. At the scene of the crime, there was were two concrete blocks and a piece of wood by the coop door, that the family claims they did not put there. So, either a very sophisticated animal moved a concrete block and a piece of wood over to the door to prop it open or a human with no heart put it there when they arrived to behead the innocent poultry. To aid them in their fight, the family has hired attorney Mark Nation. Nation argues that the family should be allowed to keep their chickens first of all because they are not in violation of any of the cited codes and there is no prohibition whatsoever from keeping chickens. However, if the city refuses to reverse its decision, then Nation is requesting a variance pursuant to section 1-9 of the Land Development Code. If the city still refuses, then Nation is requesting that the City grant the Harts an accommodation under the “Federal Fair Housing Act and the Florida Fair Housing Act. These acts require cities to make allowances for anybody who has a disability,” and since J.J has a disability, the city is required to make accommodations for him to keep the chickens. Nation also does not believe the Sheriff department’s findings that the chickens were killed by an animal and not by an angry human. The City has granted the family a 60-day grace period from the fines. Rather than waiting until the last minute, the Harts have chosen to make their plea on November 7th, 2012 at 7 pm. If you are a resident of DeBary, Florida, you have a right to speak at the hearing and let your voice be heard. Check out J.J’s Facebook page to learn how. For those of you who can’t attend the hearing, you can help by emailing J.J’s mother and requesting to sign her “Concerned Citizen” petition. Now, on to the politics of this whole matter. Regulations are there to help maintain order and balance, but at what cost? 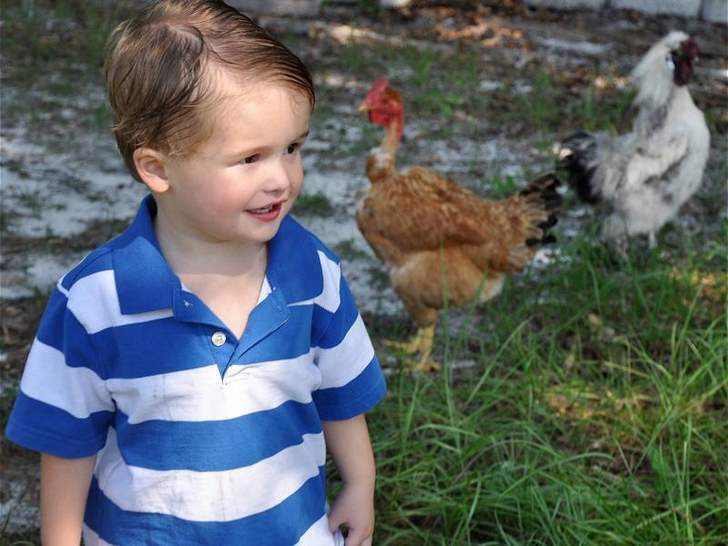 This child is benefiting from the chickens and their neighbors don’t mind them being there. The Mayor of DeBary, Bob Garcia, has stepped up and said that even if the Harts are violating an ordinance (and even he isn’t 100% sure they are), an exception should be made for J.J’s sake. Does the City just want to play big man on campus or do they know so little about autism that they are ignorant to the impact their decision could have on a young child? While I understand the city needing to enforce their own code, I also understand what it’s like to have a child who needs help overcoming autistic traits. If this were my son, I would fight City Hall to my fullest extent to help my son. What do you think? If in fact the code does exist, should the city turn the other way in an effort to help J.J or should they still enforce the code and force the chickens out of the hen house and into the fryer? Let us know in the comments or better yet, contact the DeBary City Council and let them know how you feel!